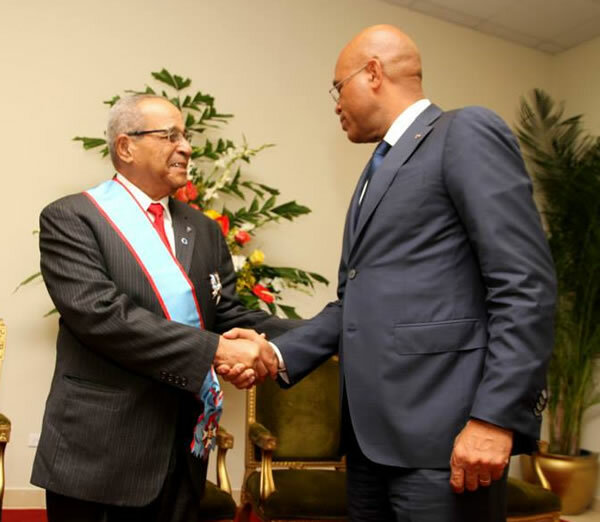 President Martelly honored Dr. Rene Charles with the Order National Honor and Merit at Grade of Grand Cross Silver at the National Palace for his work in the field of diabetic research and treatment. In attendance were Public Health Minister Dr. Guillaume and Dr. Charles's family. Minister Guillaume noted 300,000 Haitians are afflicted with diabetes and spotlighted the work of Dr. Charles's Haitian Foundation for Diabetes and Cardiovascular Diseases.